Primary school pupils from Islington and nearby boroughs Bromley and Camden visited City University London to get a taster for engineering. More than 50 local children attended an Engineering Spotlight day, where they learnt more about the subject and took part in a challenge to build shelters out of just newspaper and cable ties. The hands-on workshop saw teams of up to six children competing to build life-sized structures, big enough for their whole team to fit into. The aim of the day was to inspire young people, giving them a glimpse into some of the skills required for a career in engineering and to encourage them to consider university in the future. City Spotlight Days, now in their second year of running, are targeted at primary school pupils from underrepresented backgrounds in Higher Education. They provide an insight into university and subjects ranging from Computer Science to Music to Speech and Language Therapy. Spotlight days aim to raise aspirations by giving the pupils a glimpse into what university life is like, showcasing it as a possibility for the future. Led by a Civil Engineer, the Engineering Spotlight day highlights the importance of sticking with subjects such as Maths and Physics and helps build a picture of what engineers actually do and who they are. Research has shown that for outreach to be the most effective, it’s best to start from an early age. The aim of the Spotlight day was to inspire the next generation of engineers. I'm not sure if, before today, any of my children would have considered engineering but after the fun-filled practical activities of today they certainly will now. City’s Widening Participation Outreach team work with pupils across London to raise aspirations and help them to build skills needed to fulfil their potential. The aim is to level the playing field, making sure that all children have the same opportunities and access to higher education regardless of their background. 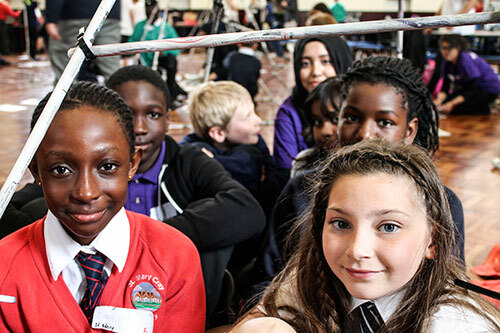 Each year, City work with more than 7,000 pupils from local schools, organising activities, workshops and advice sessions covering everything from mathematics tutoring to career guidance.